Monthly pest service includes applications of approved products such as liquids, dusts and gels labeled for residential/commercial structures. Areas of application include: baseboards, attics, plumbing in the kitchen and bathroom, and the exterior of doors and windows. We ordinarily use liquid Suspend SC inside of the home which is a safe product around pets and children and it has little or no odor and dries clear. 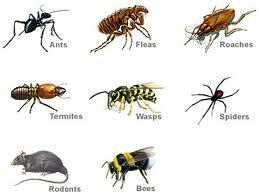 Quarterly pest service is geared more to stopping the pests from entering the customer's home. It uses all methods used in the monthly pest program, but more attention is focused to the outside of the home. The use of perimeter sprays and granules outside stops most pests from gaining entry into homes. Pest Jobs include treatments for pests such as wasps or bees, rodents, roaches, fleas, or even a one-time quarterly treatment with no plans to follow up the next quarter.